Extreme Craftivism with a Zulu Voodoo Taxi and Creating the Craftivism Manifesto - craftivism. By Betsy on July 22, 2015 in crafters + makers., craftivism. Carrie Reichardt is not only one of my favorite craftivists, she is also one of my favorite people. Her creativity and wish to free people who are suffering in solitary confinement (with some seriously dodgy cases) is mega inspiring. I just helped back her Kickstarter campaign to create a Zulu Voodoo Taxi for Kenny “Zulu” Whitmore not only because I believe in Carrie, but because I also believe in the way she uses craftivism to create dialogue. Check out the video above to see more of her work with the Treatment Rooms Collective (and yes, that’s me with the glasses in the red shirt!). I hope it spurs you on to donate to a worthy and amazing project. Speaking of craftivism, dozens of international craftivists and I are creating a craftivism manifesto! Let’s create a manifesto! I’ve had a look at loads of different manifestos and I think the Holstee manifesto is a good guide for what would be great to create. In an ideal world, we’d all come up with bits of this manifesto (either via text ideas or edit ideas or just a hearty “heck yeah!”), so that it represents many different personal interpretations of craftivism. If so, get in touch so I can send you the Word document as a starting point. Your job is to look at it, think about it, and add your thoughts and edits… sending it back to me by August 1st. Then, I’ll look at all the different documents and make sure that at the least, one of your changes makes it to the main manifesto*, so that we all have ownership of it. The end result? Together we will have created a document that helps people understand what craftivism is at its heart, with maybe some ideas on how to join in, too. *However, I am reserving the right to not include suggestions that are not related to craftivism. So keep it craftivism related, m’kay? 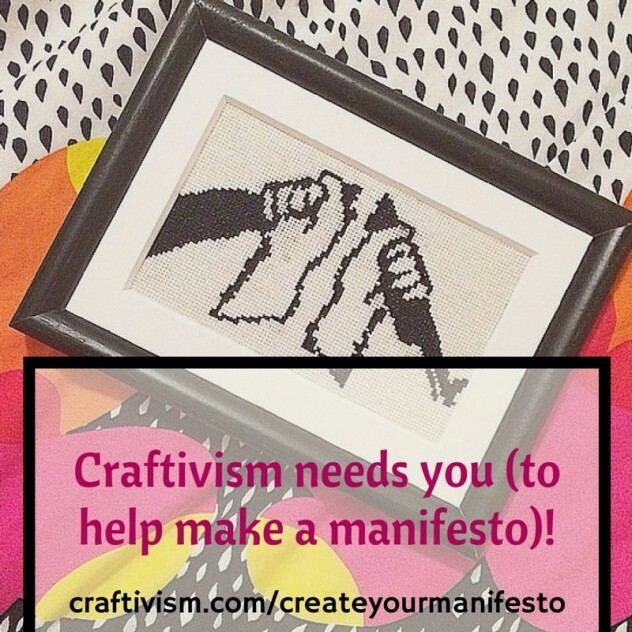 And Just Why Should We Create A Craftivism Manifesto?